Founded by Lucy Mitchell-Innes and David Nash, who previously headed the worldwide Contemporary and Impressionist & Modern Art divisions of Sotheby’s, Mitchell-Innes & Nash places exemplary contemporary artists within a historical context, revealing a continuity of ideas and aesthetic virtuosity from the Modern era through the present day. Lucy Mitchell-Innes is also a member of the selection committee of Art Basel and a former president of the Art Dealers Association of America. 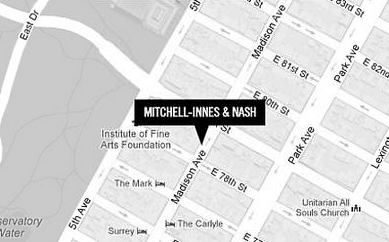 Mitchell-Innes & Nash’s renowned exhibition program fosters excellence within artistic practice, while forging an informed dialogue between emerging and established internationally recognized artists. From acclaimed surveys of 20th century masters, such as Jean Arp, Anthony Caro, Jay DeFeo, Willem de Kooning, Leon Kossoff, Kenneth Noland, Roy Lichtenstein, and Nicolas de Stael, to solo exhibitions of Sarah Braman, Keltie Ferris, Daniel Lefcourt, Pope.L, Martha Rosler, and Jessica Stockholder, Mitchell-Innes & Nash has proven expertise in both advancing the careers of emerging artists and maintaining the superior standard set by established artists. 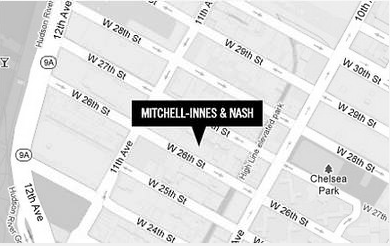 Mitchell-Innes & Nash is not currently accepting artists' submissions.